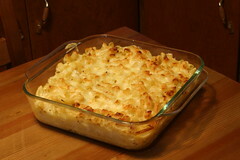 Mum thinks all children like macaroni cheese, so does auntie Amanda. Maybe mum thinks that because she just loves cheese sauce but I need to make her understand that pasta is nice with cream or tomato-based sauces but anything vaguely cheesy is just vile on pasta. Cheese should be eaten whole in pieces from a plate not melted yuckily all over perfectly decent pasta. Yeuch! Child, you are a phillistine ! Macaroni cheese is the best thing since sliced bread ! or in your case since a mouthful of green olives ! !